Found Image: You little prying Pandora! You little demon! Is this what you wanted to see? As I tuned into Andrew Lloyd Webber’s birthday special on PBS, I was greeted by the familiar overture to Phantom of the Opera. The same chills ran down my spine as the TV special opened up. Sarah Brightman appeared center stage and began to sing the famous title song. 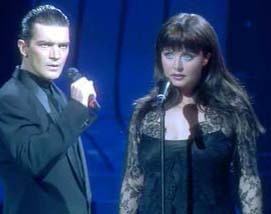 Joining her in the strange duet was a rather strange choice indeed. I loved him in Evita as Che, but Antonio Banderes coying as the masked man was a very strange choice. 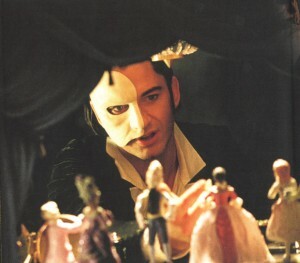 Rumors were circulating in the phan community that Antonio was in the running for the Phantom in a film adaptation of the musical. The song did not suit him at all. 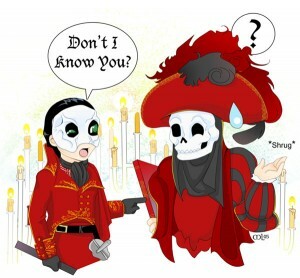 This was one of the early signs that a Phantom movie would be infamous. Joel Schumancher, better known as the director of Batman and Robin (the bad one, not the awesome Filipino musical version), was picked to direct the Phantom feature film. Under the discretion of Andrew Lloyd Webber, the cast and crew were not allowed to see the original show prior to filming. 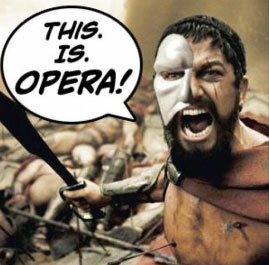 Andrew Lloyd Webber wanted a fresh approach to the movie version. Emmy Rossum and Gerard Butler were cast as Christine and the Phantom. Broadway veteran, Patrick Wilson, was cast as Raoul. Found Image: Would it kill you to blink, Emmy? There are a few good things about the film adaptation. The sets are beautiful. The design for the Paris opera house is spectacular. You really do feel swept away by the visuals. 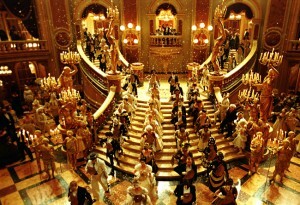 However, like Moulin Rouge, epic sets and backgrounds cannot save a movie. I also liked how the older, Methusala Raoul scenes are shot in black and white. I felt this was very reminiscent of Ronnie Yu’s Phantom Lover. 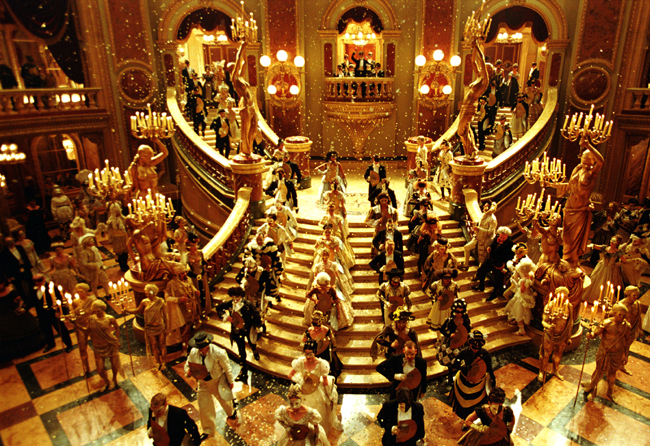 “Masquerade” had the best transition from stage to screen having a grand scale of actors, orchestra, and an elegant party atmosphere to set the tone. And then there was the laundry list of what went wrong. I have nothing against film adaptation of popular shows. Dreamgirls and Evita exceed expectations. 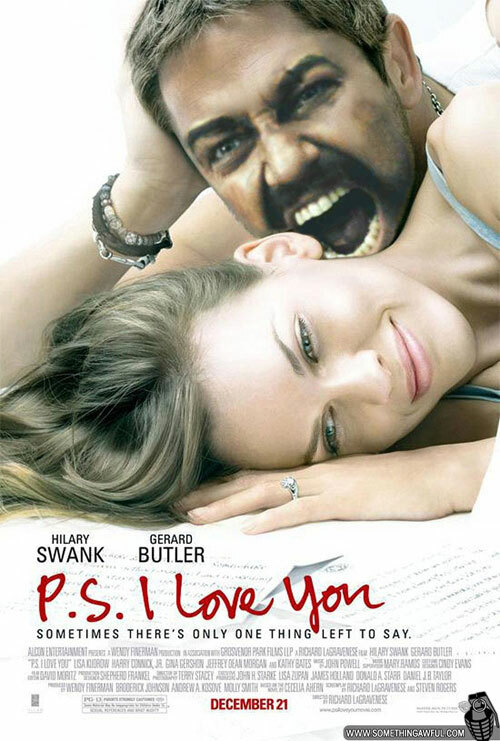 This particular adaptation, is very flawed. Emmy Rossum cannot act. 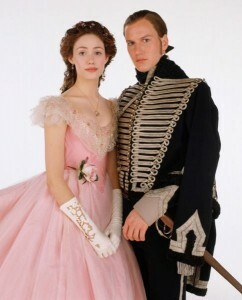 While ALW’s Christine can come off naive and daft at times, Emmy Rossum stares blankly into the camera. She lacks any emotion and looks like a dear caught in headlights. She has an all right singing voice, but I certainly have heard better Christines on stage. My main issue with what was done to Christine’s character is how “Wishing You Were Somehow Here Again” was handled. 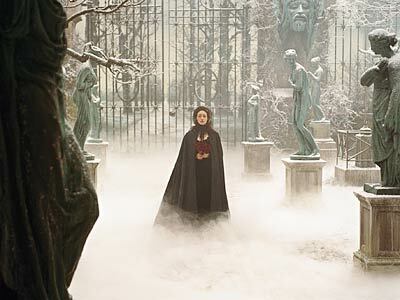 In the film adaptation, she goes to the graveyard right after the “Masquerade” scene. In the stage version, she has reason to go visit her father. It’s right after she feels pressure from both Raoul, the opera, and the Phantom to perform. Before this, she confronts Carlotta and shows that she does not want to have anything to do with the Phantom’s opera. I always felt this was crucial part in the show and I cannot understand why Schumacher decided to omit it from the movie. Found Image: Her expression never changes! 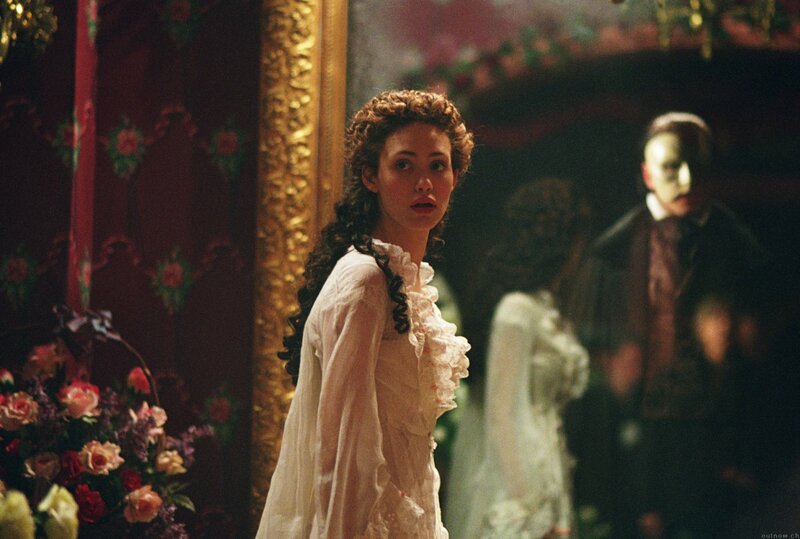 Rounding out the triangle is Patrick Wilson’s Raoul. I had no issues with Patrick Wilson. Other than the pretty boy Fabio hair, he sang the part well and he played both the childhood friend and love interest very well. Like other reviewers, I had huge nitpicks with Miranda Richardson’s Madame Giry. While she is a talented actress, her French accent was awkward when everyone was not talking with a French accent. I was dissapointed in how Carlotta was treated. I always assumed that Carlotta was a famed primadonna and I never thought she was supposed to be a terrible singer. I was also confused on the casting – why dub Minnie Driver with another actress’ singing voice? In any stage-to-film musical, we also get a new song. “Learn to be Lonely / No One Would Listen” has a nice tune, but it is very forgettable. Unlike “You Must Love Me” from Evita, this song has not made it to any stage incarnation of Phantom of the Opera. Other than the strange omissions from Act 2, the movie pretty much follows the stage version. However, there are plenty continuity goofs and mistakes done by the crew. You can look at the bullet points on IMDB’s Phantom of the Opera (2004) entry. The most glaring goof was that at times, the actors’ lips were not synced to the soundtrack. While it was a visually appealing film, the acting, editing, and filming did not live up to the stage version. If you consider yourself a phan, this is best saved for a bad movie night. I also understand that the 2004 film has been the only means for people to see the show. Fortunately, the 25th anniversary special has been released on DVD. If you are the least bit curious about Andrew Lloyd Webber’s Phantom of the Opera, check out that version instead, then watch this version.